You’ve seen it before; you’ve done a Google search about subject X, and when the results show up, there are one, two, maybe even three results that show the post author’s picture, like this. This is the Google Authorship feature at work. It’s a system by which bloggers can associate their work with their Google profile, giving them better exposure and an increased recognition. It works by a verification system which used to be a bit involved to get set up, but I found while researching this post that the major blog platforms have made great strides in simplifying things. In order to set up Authorship, you must have two things. At least one blog that you contribute to, either because you own it, or write posts for someone else’s. A Google+ account. Other Google accounts (such as Gmail, YouTube, etc.) are not sufficient; you have to have an active Google+ account. The first step is performed on Google+. 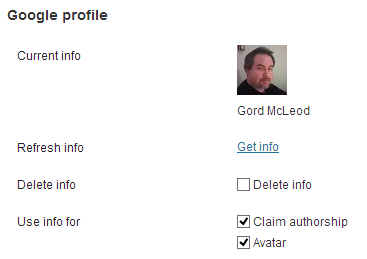 You have to edit your Google+ profile to include a link to the site you’re claiming authorship on. This image shows the links I set up for four of the sites that I run, or contribute to. The second step will vary by platform, and not all platforms support Authorship out of the box, unfortunately. In some cases it’ll require some manual setup, which I’ll also go over. The easiest of all the big platforms is Blogger, of course. As a Google property it’s pretty much automatic, as long as you have added the necessary link to your Google+ profile. WordPress required manual setup until relatively recently. In more recent builds, they’ve greatly simplified the process. First, go to your WordPress dashboard and edit your profile. From there, you can authenticate your Google account and then claim authorship with a simple checkbox. If you’re using an older version on a self-hosted WordPress install, check out the manual setup section. Google has also just announced that WordPress will work with Google+ sign-in, completely automating the process. See below for more. There are probably other platforms I’m not as familiar with that support Authorship natively, especially if you’re reading this some time after this writing. If so, hopefully the process is as easy as Blogger and WordPress make it now. If not though, don’t despair; manual setup is not all that bad. It requires a bare minimum of HTML knowledge, which I can give you right here and now. Basically you need to verify to Google that you are a valid author on the blog, confirming the link you created in your profile. You do this with an HTML link back to your profile, which will have a special relationship property added to it that indicates you’re an author on the site. In older versions of WordPress, I accomplished this by inserting a link to my Google+ profile into my WordPress profile bio like this. Naturally, you’ll want to use the address of your Google+ profile, not mine. 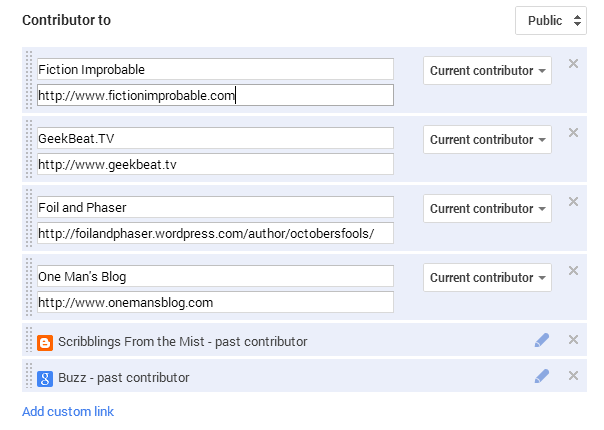 This is a handy method to use if you’re a contributing writer to a site that you don’t own. I don’t own Geek Beat, One Man’s Blog or Foil and Phaser, but this method allowed me to claim authorship on all three of those sites successfully. If you do own the site, you can insert a similar link into the site header code. This works for Tumblr, Squarespace and many other platforms. For Squarespace, you’ll want to put that link into Code Injection under Settings in the Header field. On Tumblr, you’ll Customize your blog and Edit HTML, inserting the code into the header section. Google has a page set up that allows you to automate the whole process, but it requires you to have an email address on the domain you’re claiming authorship on, so it won’t work in many cases. Google has just announced the integration of Google+ Sign-In with Google Authorship, which makes for probably the easiest of all methods of getting started with Authorship. 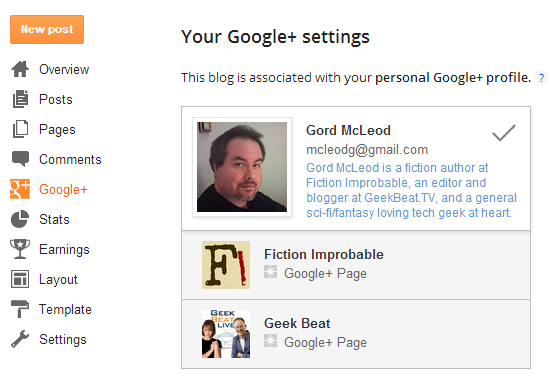 Signing in to WordPress with Google will automatically associate your posts with your profile. The pilot of this sign-in integration works with WordPress and Typepad, and it will be coming soon to About.com, WikiHow and Examiner too. Authorship can be a powerful long-term tool for increasing your recognition on the Internet, helping you stand out from the crowd in search results. Anyone who does any sort of writing online should definitely take the small amount of time it takes to get this set up. Hopefully this has been of some help. If you’re still confused or have any questions, let us know in the comments!